While the benefits of L-arginine claim to be many, researchers are still studying what constitutes a safe dosage for those who want to take it daily. 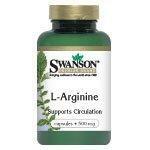 L-Arginine is a non-essential amino acid; non-essential because the body can produce it. The reason many people believe supplementation is best for this particular amino acid is that the body does not produce it very efficiently. For those who prefer not to take supplements, L-arginine is also available through a variety of foods. What Dose of L Arginine Is Recommended Daily? How Does My Body Use L Arginine? While claims state that people whose family have a history of heart may also benefit from L-arginine, it is important not to try to treat yourself for symptoms associated with congestive heart failure. Talk with your doctor before you begin taking any supplements, because not all researchers agree on the benefits of taking L-arginine in relation to heart disease. However it is recommended by some as a preventative measure for people who have experienced a blood clot in the past. Taking L-arginine by such individuals is believed to reduce the risk of the formation of another clot. One last benefit worth mentioning is that L-arginine stimulates the body's production of growth hormone, testosterone, and IGF. As the body ages, the production of these hormones diminishes which plays a direct role in the aging process. The production of these hormones helps keep skin elastic, reduces body fat, and increases sexual stamina. Your body won't revert to that of a 17 year-old, but the supplement is said to make you look and feel younger. The National Research Council's Food and Nutrition Board has not set a recommended dietary allowance for L-arginine. Each individual's needs are unique based on factors like diet and age as well as what condition you are treating. While not everyone agrees on the health benefits associated with L-arginine, it is worth talking to your doctor about it to get the latest information available. More research is needed to confirm the extent of the benefits listed here, and your doctor is better equipped to determine whether this supplement can help you.